Check the museum calendar online for upcoming events. Drive or take a taxi to here. How popular is The Jordan Museum? People normally club together Abu Darwish Mosque and Jordan National Gallery Of Fine Arts while planning their visit to The Jordan Museum. A place providing detailed information of history, geography and modern times of Jordan, this museum has made a good use of technology. Visitors are able to get knowledge not just visually, but also through sounds. It also has a feature where people can experience the ancient process of embossing and printing. Not what I expected. Very limited, small as compared to other national museums. The draw is the exhibit of the dead sea scrolls, not sure I'd paid 5 dinar if I knew. They do however have decent restrooms. A better choice is the museum at the Citadel. It's a wonderful place. We had a great time. Deserve more than 5 stars. Jordan museum is a great experience and a must do when visiting Amman. They have many exhibits dating back thousands of years, including the original dead sea scrolls! When we went they also had a great I reactive exhibit upstairs for kids to enjoy. Entry price was quite reasonable too. The museum presents artifacts from various prehistoric archaeological sites in Jordan, including the 7500 BC 'Ain Ghazal statues which are regarded as one of the oldest human statues ever made by human civilization. The collections in the museum are arranged in chronological order and also features lecture halls, outdoor exhibitions, a library, a conservation centre and an area for children's activities. 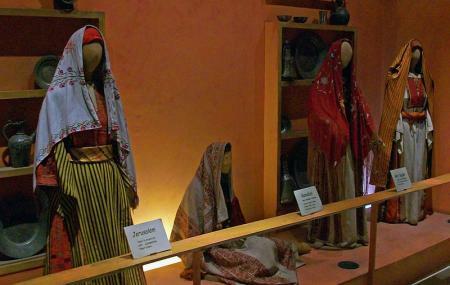 The museum was established by a committee headed by Queen Rania, which became the only museum in Jordan to implement modern artifact preserving technologies.